Junior guard C’Cories Foy led the Aggies with 16 points, six rebounds and 10 steals in their victory over rival NCCU. Photo courtesy of Erin E. Mizelle/A&T Sports. 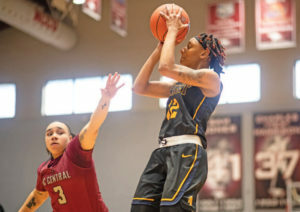 DURHAM – North Carolina A&T has figured out one simple concept in Mid-Eastern Athletic Conference (MEAC) women’s basketball play thus far this season. If they can’t score, they can’t win. Despite not shooting well from the floor and the free throw line late in the game, the Aggies held on for a 52-49 win over archrival N.C. Central in front of a hostile crowd gathered at McDougald-McLendon Arena Saturday afternoon. The Aggies (9-10, 6-0 MEAC) are still tied atop the MEAC standings with Norfolk State thanks to their sixth straight win. They have now won 12 straight road games against MEAC competition and they have won 17 of their last 18 games against the NCCU Eagles. N.C. A&T has also won 24 out of their last 25 games against MEAC opponents including the conference tournament, and head coach Tarrell Robinson moved into second place in all-time wins for the women’s program with win No. 131 passing his mentor Patricia Cage-Bibbs. What may be most impressive about the Aggies is that all six conference foes to this point have failed to shoot better than 33 percent from the floor. The last five have failed to shoot 30 percent. No one in the MEAC has scored more than 50 points against N.C. A&T. To top it all off, junior C’Coriea Foy had a double-double in points (16) and steals (10). It was Foy’s first career double-double.